For these music games you’ll need a CD player or portable speaker and some theme-related or party music. All are fun kids party games! Most of these games are written so that all kids can participate at the same time. Read them over, pick which one will work best for the age of your party guests, and play! If possible, incorporate the colors or theme of your party into these music games. For example, if your party is an Under the Sea Party, use a stuffed animal fish to pass around when you are playing the Hot Potato game. 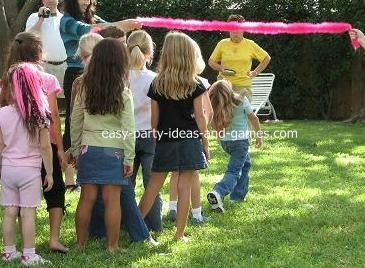 Select other children’s party games such as races, target games and more from our kids party game page. Hot Potato – You’ll need something theme related to your party to pass around the circle. While the music is playing, pass the item around. Whoever is caught with the item when the music stops is either “out", or if you want to keep everyone in the game (that is what we like to do!) instead of being “out”, have the person who is holding the item do a silly stunt, make a silly face, etc. Freeze Dance – Everyone dances! When the music stops, everyone freezes. Limbo - One of the most loved music games ever! You’ll need a long stick or other object that can be held out for the kids to go under. (Using a boa, with helpers holding each end works great!) Have the kids line up and go under the object one at a time. After everyone has had a turn, lower it. Keep going lower and lower until the kids are crawling under. At any point, let them “high jump” over it. Don’t worry about anyone being “out” if they hit the bar. Let everyone have as many turns as they like for fun! Musical Dress Up – You’ll need music, a big bag full of dress up items (visit the dollar store for hats, purses, etc.). Gather the kids in a circle and have them pass around a hand mirror while the music plays. Whenever the music stops, whoever is holding the mirror gets to put on something from the dress up bag. Have enough items so everyone gets to put on some clothes a couple of times. Variation: You can also have the kids march around in a circle, landing on pieces of colored paper. When the music stops, have the child standing on a certain color reach into the bag for a dress-up item. Hint: Don't let the kids look in the bag to select something. Have them just reach in and whatever they grab is their item! Musical Chairs – Set up chairs in a circle, with the seat of the chairs facing out. There should be one less chair than there are kids. Play music while the kids walk around and around the chairs. When the music stops, everyone must try to sit in a chair. The person who doesn’t make it into a chair is out of the game, and one chair is removed. Play continues thru a final round with two players and one chair. Musical Spots – You’ll need a dice for this game. Designate six spaces in your party area as space #1, 2, 3, 4, 5, and 6. While music is playing, have the kids run around the party area. When the music stops, the kids should move to one of the six spaces. Roll the dice, and the kids at the corresponding dice must do some action, such as 10 jumping jacks, running in place for 10 seconds, etc. Pass the Parcel - You’ll need a small gift wrapped in layers of tissue. Inside each layer, include another small gift. Gather the players in a circle and pass the parcel around the circle while music plays. When the music stops, the child who is holding the parcel gets to unwrap one layer and keep the prize. Make sure you have extra layers so that everyone gets to open one, and time the music just right so that everyone only gets one item. Statues - All the players dance and run around while the music plays. When the music stops, all players must freeze as if they are a statue. If anyone laughs or moves, they are a broken statue. Play until only one person has never been caught moving.Have fun with your music games!